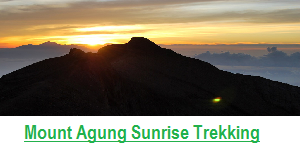 Hiking and Trekking Tour in Bali becomes as new interesting tourist attraction for whom visiting Bali. Bali has a lot of trekking destination for those who love to challenge Bali nature and who would like to learn about culture plus exploring the hidden side of Bali such as Mount Batur, Munduk Village, Sambangan Village, the Jungle of Tamblingan, Sekumpul Village, and Mayong Village. These places have different challenge and sensation. Normally The best time to go hiking in Bali is during the dry season start from April to Oct because the trails are accessible and not slippery. Above all, it is most likely that there are no clouds or mist so the views are clear. And why you should hire guide because the trails can be unclear on some parts of the hike. 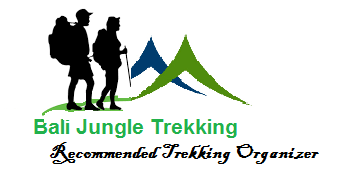 It is best to at least arrange a guide one day before the hike so proper arrangements can be made and also our guide will make your trekking tour more useful as our guide will explain everything that you see during the trek and also our guide will make sure your safety. 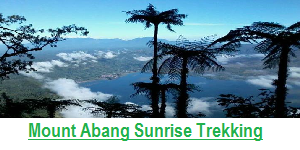 Tamblingan Jungle Trekking and Canoeing tour – During the trek you will walking through the tropical rain forest that borders The real protected jungle and Tamblingan lake, also you will see some old legend temples inside the jungle, our guide will happy to explain you about it. Also you will learn a lot about some plant that you may see during the trek, and the most interesting point is when you start crossing the lake to the Finishing point, it’s will blow your mind and make you feel very relaxing. 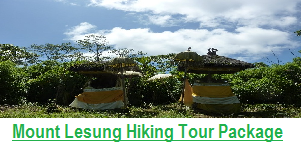 Sekumpul Waterfall Trekking tour Package — The main point of this hiking tour is visiting Sekumpul Waterfall which is definitely the best waterfall in the island of Bali since it’s consist of 7 waterfalls and you will be walking through hundreds of steps on narrow path, various tropical plantations, jungle and bridge, Rice field and see beautiful hill view during the trek. Our guide also we offer you some of local fruit and fresh coconut water during the trek for you and our guide also happy to show you where the best place for you to swimming and make sure your safety. 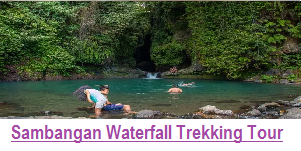 Sambangan Waterfall Trekking Tour – During this trip you will visiting sacred garden pool and 4 waterfalls including aling-aling waterfalls the most famous waterfall in sambangan village, you will walking through the rice field, little jungle, walking along the river side, and you also will be able to do Jumping and sliding in the waterfall. Our local guide already trained well in handled this kind of activities ( Jumping and Sliding). 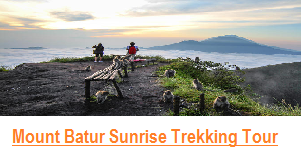 Mount Batur Sunrise Trekking Tour — Mount Batur trekking is the most popular sunrise trekking tour in Bali and one of the most challenging trekking activities that you have to do in Bali. It is the most recommended volcano trekking in Bali as seen on Tripadvisor, the view from the top that will forever stay in your mind, an experience that you will never forget during your life. 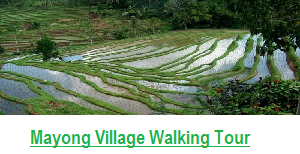 Munduk Village Trekking Tour – During this trek we will take you to exploring our village named Munduk village that located in the center-North of Bali that won the first French tourists and gradually came to be known by many as a ‘Retreat’ in the mountain, away from the crowds and close to nature. The region is surrounded by rain forest and offers many options to walk through forests, 3 waterfalls coffee plantations, cloves, Vanilla, avocado, and much more. With our local guide your day will be more memorable as he will explain everything that we may see during the trek. This was the most amazing day of our 10 days in Bali! We book the jungle trek of Tamblingan thru Bali Jungle Trekking Team, it’s was very easy booking process, and Dewa ( Our Driver ) picked us up promptly at our hotel in Seminyak at 7:15am which is it’s was on time. You can tell he loves what he does! Then during on the way he took us to arrive at the temple named Ulun Danu Temple, the first stop, went by very quickly as we enjoyed taking in the beautiful scenery and wonderful conversation in the car. My husband and I were traveling with 2 daughters and son and all of us enjoyed the trip equally as much. Once we arrived at the starting point for Jungle Trek, we were greeted by another wonderful Local guide, who took us to exploring this amazing jungle. She had so much information to share about the ecosystem of the jungle and the religious practice of the Local people. We could have easily spent many more hours enjoying her lively, kind, and friendly company. We were greeted by the wife of a local fisherman who rowed us across the lake to where Our Driver was waiting for us. Then Dewa took us to Local Restaurant with Twin Lake View , After lunch we drive back to the hotel even we got crazy traffic during on the way but we face it all with a smile. The Balinese people have a genuine caring nature, always making us safe during the trip. It was such a treat to spend time with local Balinese people who genuinely enjoy sharing their country with visitors. Highly recommend! We Booked for the Sambangan waterfalls medium trek, and we were picked up from our hotel in Kuta at around 7 am with private car and as it was a private driver he was flexible with us getting breakfast and stops along the way before the trek, since we don’t want to feel hungry during the trek. It was a long drive but you get to see some beautiful scenery and the driver also very informative therefore we not feel bored in the car for about 3 hours. Once there we met our Local tour guide who was really friendly and knowledgeable about the surrounding area, therefore during the trek we were stopping at different points to explain about the surroundings, from plants, animals to local lifestyle in the area. We went through the rice fields, stopped off for some fresh coconut and then went to the waterfalls. First we swam at the “Blue lagoon secret garden” which was stunning, then we went down to see Aling – aling waterfall then continue to the natural water slide and had the chance to jump off a couple of them, 5m and 10m high waterfalls, it’s was a crazy thing that we ever done before, it’s so amazing, after that we were served lunch Box which was included and very nice, we joined up with another group as there was only 5 in total and it was really good. The Local guide were great fun and very attentive to show us who to Jumping and sliding in the waterfalls.